It may be to your surprise that I am not your average doctor. My name is Dr. Angus Burger, I’m 8 1/2 years old, and I’m a white, fluffy, West Highland Terrier. When I was a puppy I knew that I wanted to work paw and hand with people. Dr. Ronald Kurlander is a psychiatrist and when he took me under his arm, we became the perfect team. How many doctors will sit on your lap and keep you company in the waiting room? Not many! I’ve been trained with the abilities of a homeopathic therapist. Band-aid applications for minor cuts are no problem, and confidentiality is a promise, so your secrets will always be safe with me. When Dr. Kurlander is ready to see you, I’ll lead you to his office. My duty is to let you pet, hold, and snuggle me until you are relaxed and comfortable for your therapy session. This method is called “reverse massage therapy”, in which I get a massage from you as you get my undivided attention. My other experiences include recreational therapy. Dr. Kurlander and I would make 2 to 3 trips a week to nursing homes and hospitals where I give love and comfort to those in need. When you feel in need of someone to talk to, you now know you’ll always have the company of a loyal, trustworthy, and loving dog with the power to bring happiness! Yours truly, Dr. Angus Burger. Dr Kurlander has worked with Dr.
Angus Burger for the past seven and one half years as a therapy dog to improve his patients’ emotional wellbeing. 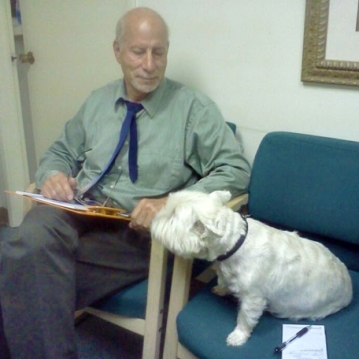 According to Dr. Kurlander “Dr Angus Burger makes patients feel comfortable, and he’s very intelligent as well as empathetic. He can tell when a person is happy or sad and he’ll sit in their lap”.